We have spent a lot of time in the rain since I last wrote! 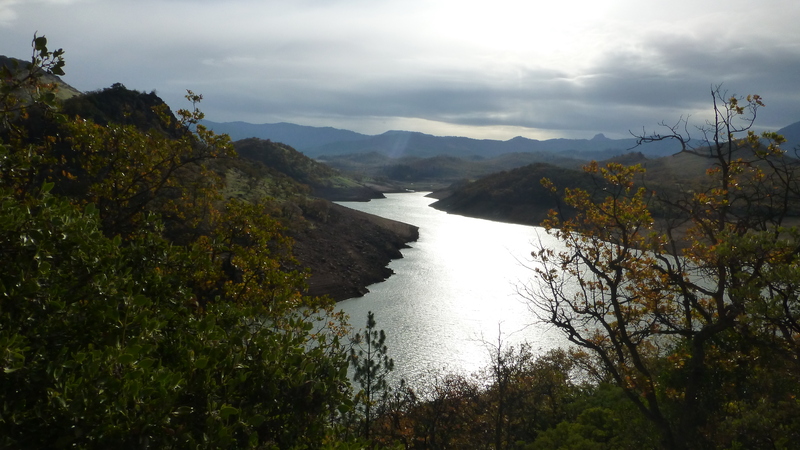 We stopped at Emigrant Lake County Park near Ashland, Oregon and had one nice weather day. We explored a park trail and ended up with a nice view of Emigrant Lake. We were glad to have the opportunity to go to lunch with another of my father’s 58 cousins, Guerin and his wife, Donna. They treated us to lunch at a nice restaurant downtown. It was good to visit and catch up on family news. Guerin was reminding me this afternoon by email that it was time for another post. Guerin, this one is for you! 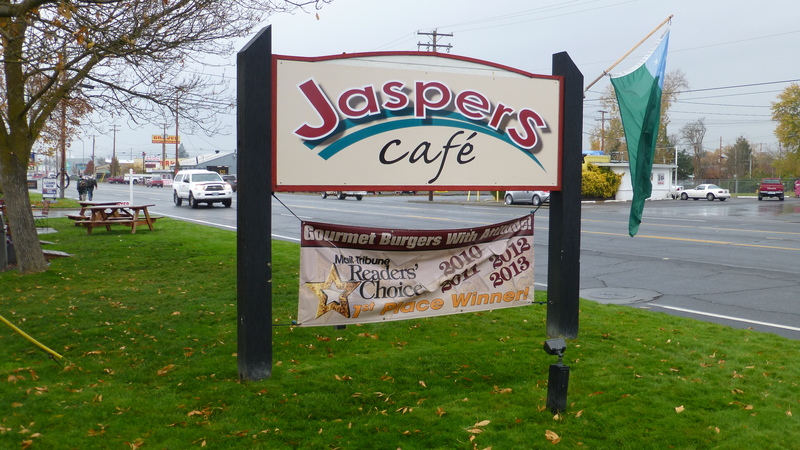 Another day we went to the favorite hamburger joint, Jaspers Cafe – info provided by Trip Advisor. The reviews warned of a small place and waiting for a table, and that was all true. There were tables for outside dining, but then there was that rain…. The small tables inside had signs suggesting that you invite people to share. After so many days in the rain, talking mostly to each other, we were glad to invite another couple to share our table. We had a great time comparing notes about the Ashland and Boise Shakespeare Festivals, our life style, and their vocations as Zen Buddhist Monks. My family lived for a time in Thailand when I was a young teen and I still remember being very careful not to touch or bump into a monk. Having physical contact with a female would require them to go do all their prayers again. So, it was quite interesting to talk to a female Buddhist monk. Ashland feels like somewhere we’ll need to visit again. We missed the Shakespeare Festival by just a few days and the rain curtailed other activities so another visit is warranted – in a different season. The same is true with Eugene. 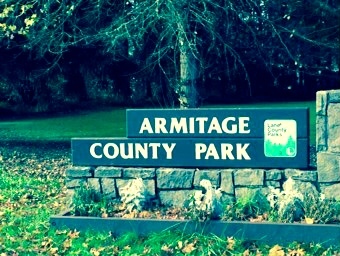 We were surprised when we drove into Armitage County Park to find that the campground was fully booked – in November! 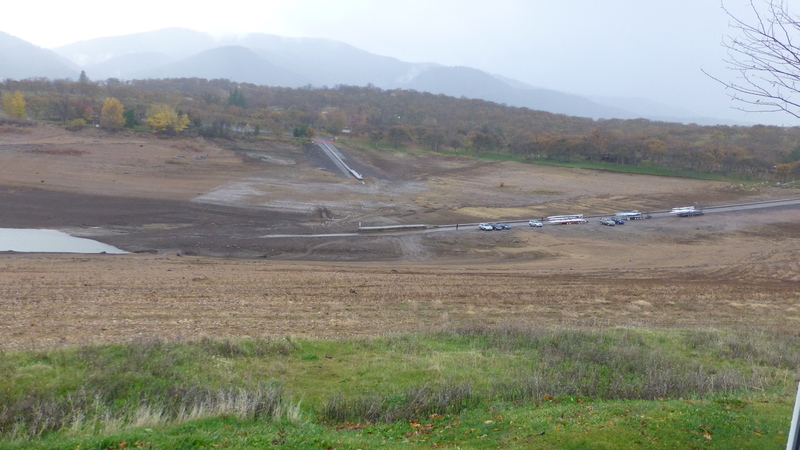 It didn’t take long to realize the reason was because there was a University of Oregon football game that weekend and people from outside Eugene were staying in the park. The Ducks won and they were all happy. Oregon State Parks are very nice in general and these two County Parks were outstanding. The park in Eugene even had a laundry facility and cable TV, in addition to all the normal upgrades. Alas, even though the park was one of the finest we’ve been to – we were tired of the rain and tired of being cooped up in a small space. We left on Monday, a day early, and came to my parents’ home in Vancouver. It is still raining, but at least we have other people to talk to and space to be together or alone as we choose. 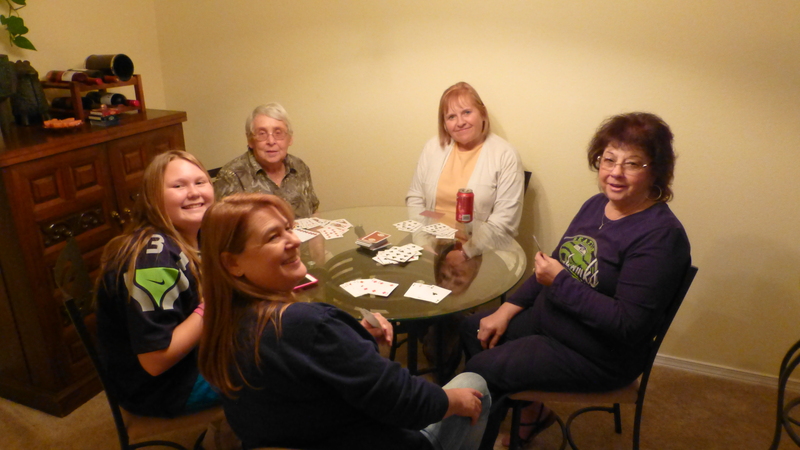 My aunt Bonnie and cousins, Lisa, Chris and Kylee (last seen at the chili competition in Las Vegas) joined us and we had a nice Thanksgiving. After dinner, we enjoyed our traditional Russian Rummy card game, breaking for the Seahawks win, and then concluding the game. On Saturday, Randy and I will leave for two warm weeks in Mazatlan, Mexico. When we come back we will head for a cold, wonderful week in Boise, celebrating Christmas and Archer’s birthday. The trailer is at a local RV renovation business getting new window shades. We will see it again at the end of December when we head south to warmer weather and fewer rainy days.